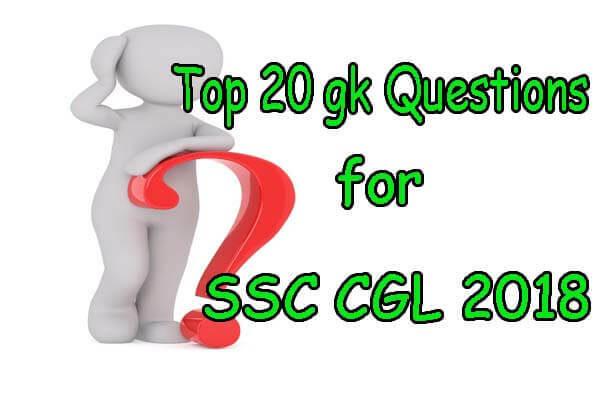 In this Chapter, we will see the "Top 20 gk Questions SSC CGL 2018". These are the important questions so remember all the gk Questions. Let's Start "Top 20 gk Questions SSC CGL 2018"
3.Who was the President of the Constituent Assembly? 4.Which innovative discussion process is introduced by the Indian parliament to the World Parliametary systems? 10.Who among the following British persons admitted the Revolt of 1857 as a national revolt ? 11.How much of the earth’s land surface is desert? 12.Which of the following is called the ‘shrimp capital of India’? Answers:- "Top 20 gk Questions SSC CGL 2018"